Because mold spores live everywhere – inside your home or office and outside as well - removing ALL mold from your property is virtually impossible. The truth is these troublesome spores are microscopic, floating along on the air, entering your home or business when you open doors and windows, through your heating and cooling systems, and even coming in on people and pets. When mold spores arrive in your home or business they seek out damp, moist spaces in which to thrive. Thus mold growth (spores growing into colonies) begins quickly, manifesting within only 48 hours. You’ll know when mold is there, because even if you don’t see it, you’ll smell the strong, musty odor it emits. These bothersome mold colonies can produce allergens and irritants which result in health concerns for those living in your home and those working in your company. Complete mold removal is impossible, so when companies “guarantee” to remove all mold, their claims are false. On the other hand, mold remediation is quite possible. Mold remediation is a process focused on reducing mold levels in your home or business back to natural levels. And while each mold problem is unique and will require a customized plan for your home or office, the steps to remediation are similar in all cases. Step one is contacting a trusted mold remediation specialist like SERVPRO. In step two, an inspection and assessment is performed. This is followed by steps three and four and includes mold containment and air filtration. Steps five and six feature removal of mold-infested material and mold, followed by the cleaning of all the property’s contents. The process is completed in step seven, the restoration of your property. The restoration process includes repairing the mold damaged areas including, but not limited to, replacement of drywall, subflooring, carpeting, as well as painting, and any reconstruction needed depending on the severity of the damage caused by the mold. Interested in learning more about SERVPRO of Fontana? Read testimonials from real clients or give us a call at (909) 357-4337. Springtime tends to bring rainy weather. Combine that with warm temperatures that melt snowdrifts (in your area, and on nearby mountains), and you’ve got a recipe for plenty of excess water. Rivers are more likely to spill their banks in the spring, and higher-than-normal groundwater levels can cause leaks into your garage/basement that you aren’t even able to detect beforehand. Weather-stripping is the process of sealing openings (like doors and windows) against the elements. In your garage, you’ll probably see it in the form of rubber strips at the bottom of your doors. When intact, they form a seal strong enough to keep moderate water flow from entering your garage. But as weather-stripping will wear down over time, it’s important to check it periodically for cracks or other signs of damage, and to replace it if needed. Don’t worry – it’s an easy and inexpensive task. Public streets (and even many private ones) have gutters and drains that are your home’s first defense against heavy waters. But they aren’t infallible, and during times of particularly heavy flooding they may overflow and allow water to back up onto your property – particularly risky if the nearby land slopes downwards toward your home. If you don’t have something similar already, consider having a French drain installed to route water safely away from your garage. If drainage is lacking around your home, flood vents are one easy and efficient way to alleviate the problem. They allow any water that has entered your garage to drain in a safe and controlled fashion. While their effectiveness will be limited against a massive flash flood, homeowners who frequently contend with a relatively small amount of water in the garage will find flood vents a smart investment. 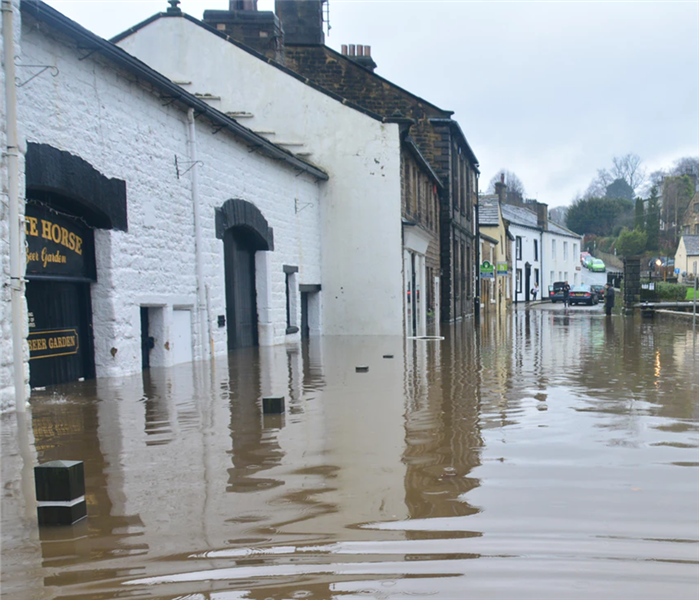 Low-level floods can be kept at bay by physical barriers. Sandbags are common and inexpensive option, though their weight can pose a challenge without the proper equipment. Inflatable flood barriers (or “quick dams”), which rapidly expand when they make contact with water, are also available from home supply stores. It’s important to note that you don’t generally want to completely barricade your property – this can result in water pooling between buildings and causing additional damage. Rather, set up a pyramid-shaped wall near the flood zone to divert the moving waters away from your home as much as possible. For more water damage restoration tips and professional service, call SERVPRO of Fontana today at (909) 357-4337. Winter is coming to an end. Time to get outside and throw away those cold-weather blues! But unfortunately for homeowners, it’s not all fun in the sun. Especially with all the rain in Southern California! The arrival of spring has brought heavy rains and rapid snowmelt, and together they pose the risk of sudden and severe flooding. Even if you live somewhere warm – like San Bernardino County – the snow melting off of nearby mountains can raise local water levels. 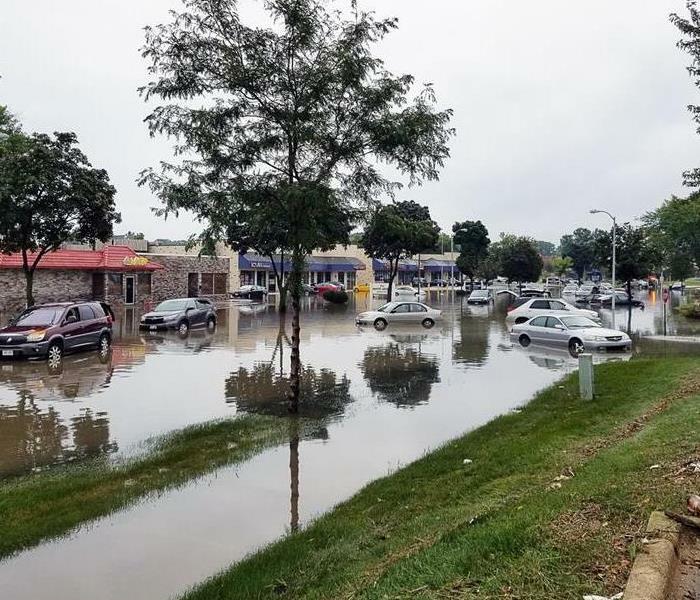 And we’re not just talking about rivers dramatically spilling over their banks: pooling water and elevated groundwater levels are enough to damage your lawn or flood your basement. As a homeowner, early spring is the ideal time to take protective measures against flooding. Here are a few quick and simple steps you can take today that will save you a real headache down the road. Most homes are built with water drainage in mind, and feature ways to route that excess water away from your foundation. These often include outdoor flood drains, but may also include indoor drains (especially in the garage, mudroom, or any other area where water is likely to enter). Drainage systems are great, but they run the risk of clogging up with leaves, twigs, and other debris. If that happens, the water will have nowhere to go and will just backup right onto your property. Take a few minutes to visit the drainage sites around your home and ensure that they still allow water to flow freely through. If not, see if you can clear the blockage yourself, or call in a professional for assistance. Similarly, the gutters and downspouts lining your roof are an important part of your home’s drainage system. Their goal is to catch rainwater and route it away from your home. And of course, they’re quite prone to clogging – especially after the autumn and winter months, when leaves and twigs fall from nearby trees en masse. If that happens, rainwater will just pool alongside your home and is likely to penetrate the foundation. Cleaning your gutters and downspouts may be a relatively easy (though dirty) task, or quite the hassle. It really depends on your home’s height, how easy it is for you to access the roof, the shape of the building, and other factors. Either way, it’s well worth doing at least once or twice per year, so call in the home-cleaning service professionals for assistance. Not everybody knows that water alarms (also called flood sensors) exist, but as water damage restoration professionals, we’d recommend them to just about every homeowner. These little devices work similarly to a fire alarm, in that they will alert you immediately to the presence of water and give you a chance of containing the damage before it spirals out of control. Install one in your basement and in any other subterranean rooms – water alarms typically start at only $10-$15 each, and have the potential to save you thousands of dollars down the road. For flood damage restoration and other home/commercial services, SERVPRO of Fontana is the name you can trust. Call us today at (909) 357-4337, and let us know how we can help. While it may be a new year, that doesn’t mean all of the troubles from last year are gone. If your home has a mold problem, that issue is going to continue to plague you until you look into home mold remediation services. 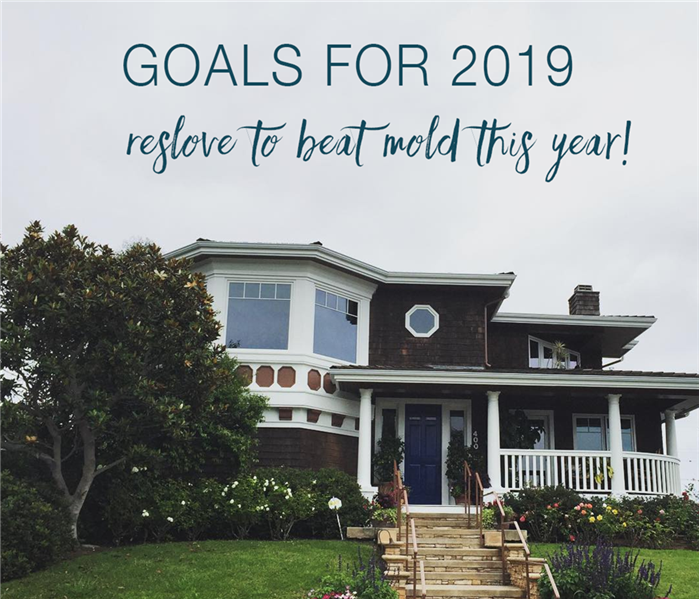 If you suspect you still have mold in your home, this is the year to resolve to get rid of it! 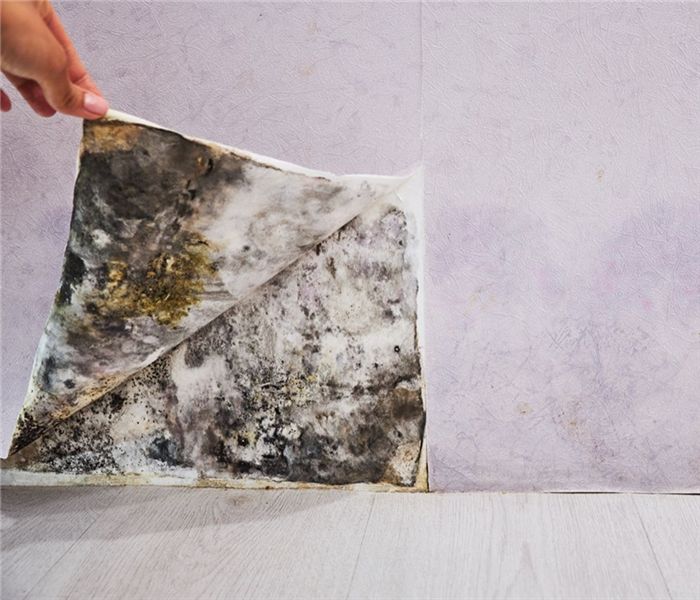 The mold in your home can be caused by a number of different issues, and you’ll need to address this underlying cause after you’ve had the mold removed. In some cases, a minor leak in your plumbing is the cause. In other cases, it may be something more involved like a leak in your roof or flooding from a storm. Any time you have moisture in your home, mold spores can begin to multiply and grow. If you don’t deal with the cause at the same time you have the mold removed, it’s only going to return. Why Deal with Mold Now? You may be wondering why you should deal with mold now if you haven’t done so before. The bottom line is that mold is dangerous to your health. You should never put off having remediation services come in and clear the mold from your home. Otherwise, it may impact your breathing, make your allergies worse, cause damage to your home, and more. If you have mold in your home, make it your New Year’s resolution to have it treated. The longer you put it off, the larger the problem will become and the bigger the impact it will have on your health. Don’t try to remove mold yourself—without the right equipment and training, it’s impossible to find all of the mold or dispose of it correctly. Call SERVPRO of Fontana today to schedule your mold remediation. Contact us at (909) 357-4337 or email us. Do you have a disaster recovery plan for your business? If you don’t, you may have no idea what to do when a fire damages your business or when a flood causes extensive water damage. If you don’t have at least an outline of what steps to take when a disaster hits, you may lose valuable time and money. 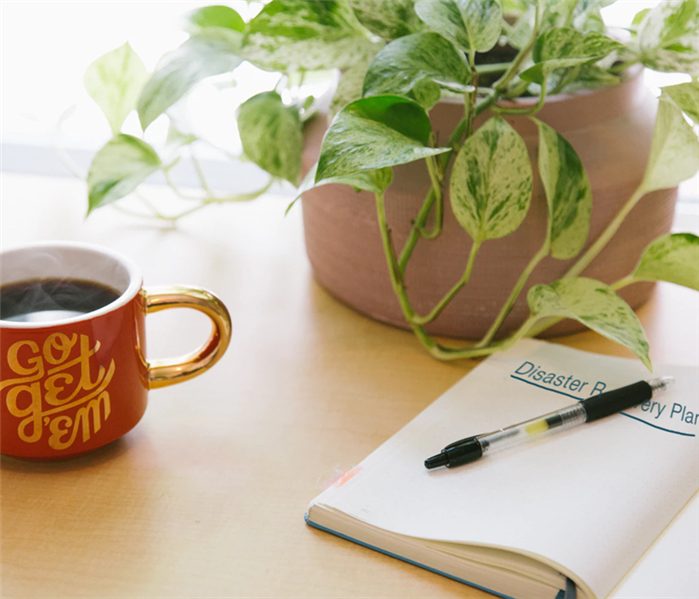 Having a disaster recovery plan in place will help you focus on what needs to be done, plus it provides instructions to your employees and managers in case you’re not available when the disaster happens. These are common issues, but you should also outline responses to less common problems that affect your local area. What should you/your employees do immediately after the event? If the event happens while the business is open, how will you protect your customers and employees who are in the building? What services do you contact to begin the repair process? How will you finance these repairs and pay your employees if you have to close your business for days or weeks? What sort of public statement will you make? You can even draft statements for some of the more common issues or create templates to fill in. If your business has to close for weeks or months, how will you continue to generate income? Will you be able to work from a temporary office, from home, or from another location? These are just a few of the questions you need to ask. You also need to have all of the contact information on hand for SERVPRO of Fontana. Our commercial services include water, fire, and storm damage repair as well as mold remediation and disaster recovery. Contact us at (909) 357-4337 or email us at SERVPRO9656@SERVPROfontana.com to learn more about how we can help your business get back on its feet after a disaster. We regret to report that this past year has been a devastating season for fire damage in California. As of October 2018, a total of 7,295 fires have burned an area of 1,520,814 acres, according to the California Department of Forestry and Fire Protection and the National Interagency Fire Center. Thankfully SERVPRO of Fontana has been able to step onto the scene. Unfortunately, many commercial buildings and businesses have been effected by the fire damage. In addition, there was also been wind damage, water damage, and other natural disasters, causing substantial damage in a matter of minutes. There's never a good time for disaster to strike your business. Every hour spent cleaning up is an hour of lost revenue and productivity. So if an emergency situation arises in your business, give SERVPRO of Fontana a call. 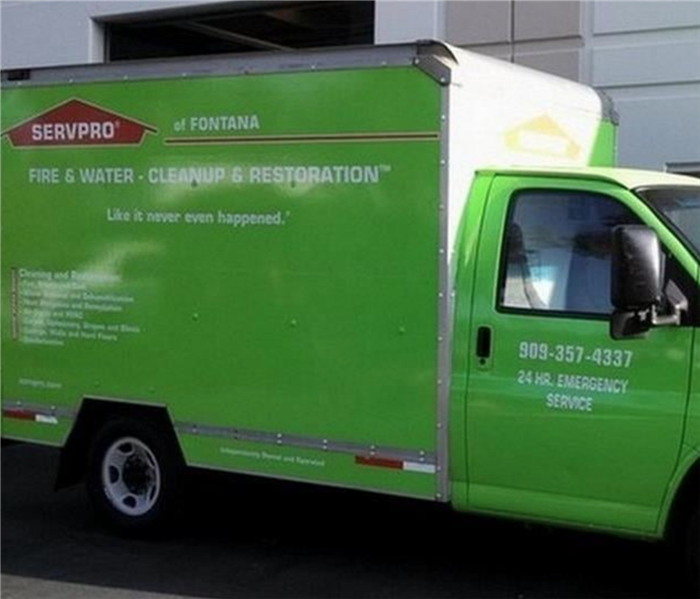 SERVPRO of Fontana has the staff, technicians, training, and equipment to handle large commercial damage. Whether you're in a skyscraper or a small building, we're equipped to respond quickly to any property type in Orange County, Los Angeles County, and other surrounding areas. We implement strategic procedures to restore your property to original luster. 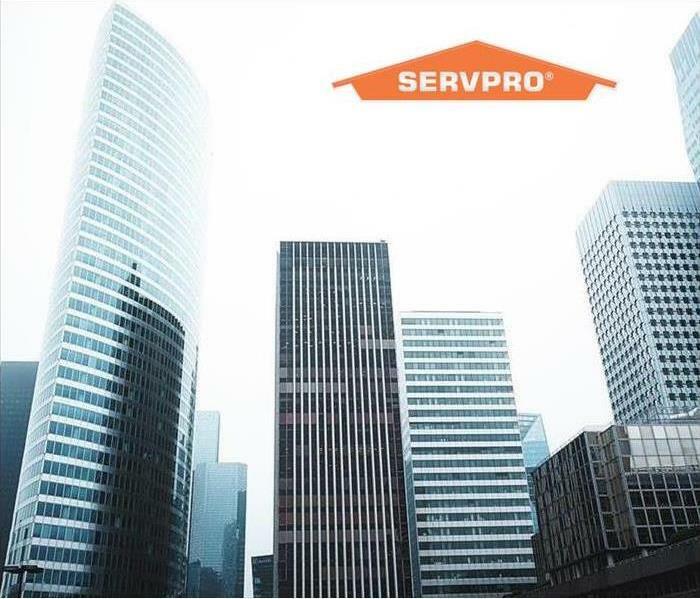 SERVPRO of Fontana will respond immediately to fire damage, water damage, or other natural disasters in your business, no matter how immense the damage. 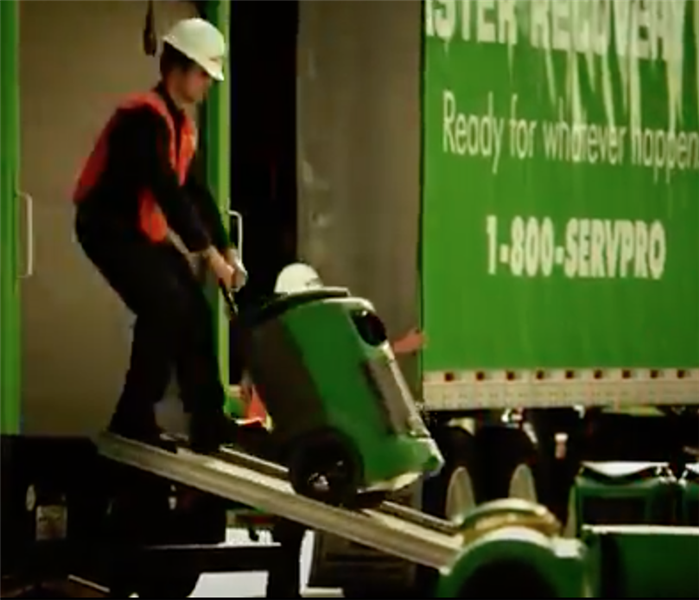 SERVPRO has over 1,700 Franchises with several unique Disaster Recovery Teams located throughout the U.S. to quickly respond to any large scale events and disasters. If you're experiencing commercial property damage, please give our team a call today! Today we're featuring some positive feedback from our clients who hired SERVPRO of Fontana to help with their unique emergency. We responded to commercial damage, fire damage, water damage, and other natural disasters. Whether you're a resident or business owner in Orange County, consider calling SERVPRO of Fontana when disaster hits! "SERVPRO was truly a pleasure to deal with. Thank you Daniel and team! They were polite, courteous, and helpful throughout the duration of the job. I would rate them 10/10 on their restoration service, professionalism, and overall satisfaction." "They Were at my House within the Hour"
Want to Read More? Check out Raving Reviews from our Clients. Fire and water damage are two of the worst types of damage, and either one can shut your business down for days, if not weeks. Fires, floods, heavy storms, and other disasters can result in mold growth, smoke damage, and even lead to structural issues that force you to rebuild your business. Fortunately, SERVPRO of Fontana is here to assist you in restoring your business. We understand the dangers of commercial water damage and fire damage, and we’re ready to help you recover as quickly as possible. Our commercial restoration services focus on getting your business cleaned up and ready to reopen in as little time as possible. The longer your business is closed, the more business you’re losing. We send in a professional disaster recovery team focused on removing damage and repairing your commercial site. Water damage is one of the most insidious types of damage because it can occur inside walls or under the floor. You may have major water damage, but never know it. 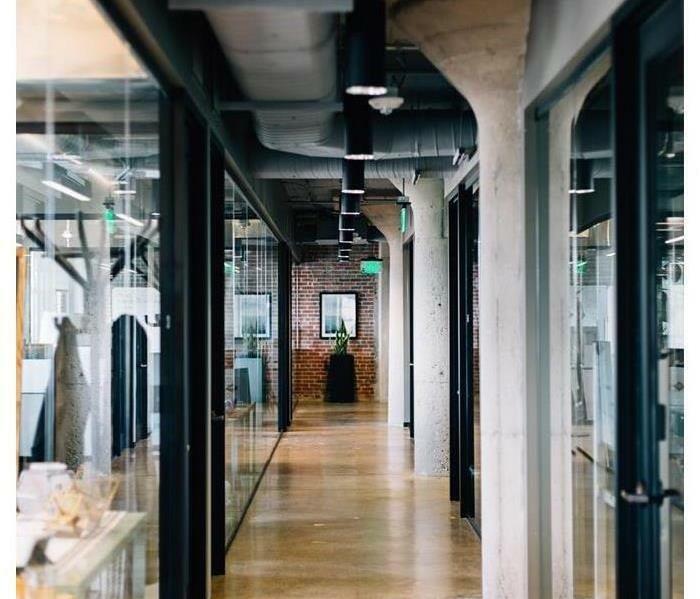 Our commercial and industrial restoration team is trained to search everywhere for damage and deal with it so you don’t have structural issues or mold later on. We will quickly dry out the area, remove any odors, and even clean your fabric and upholstery. Fire damage comes in two stages: there’s the actual damage from the fire, and then there’s the lingering damage from smoke. We take care of both, plus we can clean up any water damage that occurred from putting the fire out. Dealing with smoke damage can be a long, hard fight, but we have the right tools for the job. We’ll make certain your business is restored to its former condition and doesn’t have any lingering smoke smell. Mold will not only close down your business, but it can also make your employees and customers sick. It’s a serious issue that can occur even without a flood or any major water damage. A small leak can evolve into a huge mold problem faster than you might think. Our experienced mold remediation team will remove all mold, find the source of the leak, and restore the area to its previous condition. Have water or fire damage? Do you suspect you need mold remediation? SERVPRO of Fontana is here to help you with all of your restoration needs. Contact us today to discuss your commercial restoration needs. California, especially Southern California, has recently been hit with a number of major fires. These raging wildfires aren’t the first the state has had to deal with, and they likely won’t be the last. Since the beginning of 2018, there have been 4,587 separate fires raging across the state, which is only slightly above the average for the past five years. More than 600,000 acres have been affected. A number of people have been killed in these fires, including civilians and firefighters, and thousands of residential and commercial buildings have burned. In addition to those who have lost their homes, thousands of other residents have had to leave their houses due to the proximity of the fires. Some of these blazes still aren’t contained and continue to threaten people’s homes. Even if it doesn’t destroy your home, fire damage can seriously impact your property and your health. Fire damage can weaken the structure of your home, making it more susceptible to damage from earthquakes or other disasters. When firefighters put out the fire, the water from their high pressure water hoses can also cause water damage to your home, leading to mold growth and other issues. 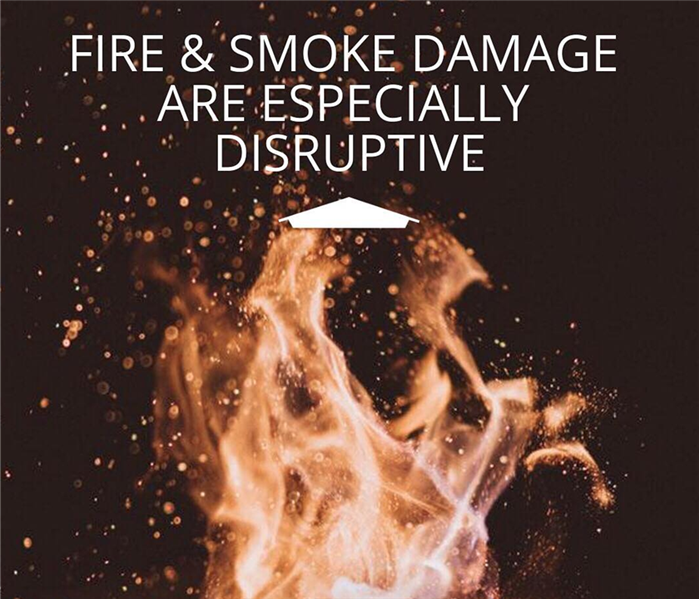 Even if there’s no major structural damage from the fire, you may still have smoke damage. Smoke can cling to carpets and walls, leaving your home with an odor for months. It can discolor paint, flooring, and furniture, make asthma and other breathing conditions worse, and leave everything you own smelling like smoke. It’s not something you can simply live with—it’s something you need to have professionally cleaned. As a professional cleaning company, SERVPRO of Fontana is here to help you deal with fire, smoke, and water damage. We have the tools and experience needed to deal with any fire or smoke damage, no matter how horrible it is. We will assist you in removing soot, cleaning your floors and possessions so that they’re usable again. We can assess the damage and let you know what isn’t salvageable plus temporarily board up any holes or tarp your roof until you can have your home properly repaired. Don’t assume a quick carpet cleaning and a fresh coat of paint is all it takes to get rid of smoke damage. This is a bigger issue that does require professionals to handle. Contact us today for more information about our fire and smoke cleaning services or to make an appointment. Storms and floods can do a large amount of damage to your home. You may find that your entire basement becomes filled with water or that your roof has developed a huge leak. Storms can break windows and send tree limbs crashing down onto your home, resulting in major damage. Any time you’re facing such storm damage, you need a professional to assist you with cleanup and restoration. If water leaks in under a door, around a window, or through the attic, you may think all you need to do is mop up as much as you can and then dry out the flooring. Often, though, this isn’t enough, especially when flooding has occurred. The water you see is usually only a portion of what has entered your home. It may have seeped under your floorboards, got behind fixtures, or has even pooled within the wall. A professional team knows how to find all of this moisture and remove it before it starts to promote mold growth or cause other issues. But cleanup is really only half of the project when your home has been damaged due to storms or flooding. You also need to restore and repair anything that was destroyed or damaged. While this certainly includes the exterior sections of the house that let water in, it also involves restoring the floors, repairing water-damaged trim and woodwork, and more. General contractors may not know exactly what needs to be done to repair this damage. Instead, their instinct may be to tear it all out and start over, a costly and time-consuming process. How Can SERVPRO of Fontana Help? SERVPRO of Fontana is a professional storm and flood cleanup and restoration company here to help you deal with all of the issues that come after water has entered your home. Our trained professional disaster recovery teams are here to make certain your home is dry, safe, and mold-free after it’s been flooded. They can assist you in restoring any area that’s been water-damaged back to its original state, too. Contact us today if you’re in need of water cleanup and restoration.